While this is usually a gross exaggeration, when it comes to cell phones it seems pretty accurate. By the end of grade school, at least, everybody’s got one. But as your mom probably used to say to you, if everybody jumped off a bridge would you go too? The fact that really every child does seem to have a cell phone by the age of 10 is not the deciding factor in whether your child should become a part of the “everyone,” but you may be surprised to learn that it is a worthy consideration, among others. Let’s take a look at some of the pros and cons that should influence your decision making on this important issue. If you want to be a tad bit selfish, consider the fact that it’s bound to be easier for you if your child has a cell phone. “Call me when you’re ready” is often so much easier than having to set an exact time and place for pickup. Texting your child at school about a change in plans for the day is easier than having to call the school and getting the school to deliver a message or come to the office and call you. The luxury of always being able to communicate with your child comes with almost daily advantages for you. For your child, a phone will allow him to be more independent, to do things he might not be able to do if he didn’t have a way to keep in touch with you. It also teaches him about responsibility and communication in situations where he’s away from home. There really aren’t any public phones anymore, so without a cell phone it’s difficult for your child to communicate with you when he isn’t with you. He’s usually going to be reliant on borrowing a friend’s phone. Your child’s teachers will assume he has a phone too. Some teachers allow kids to text in questions, have specific study apps they ask kids to use, and create group chats for extra-curricular sports and special interest activities. Having a phone can be somewhat of a social “must” too. Kids don’t call each other anymore, but they constantly text and communicate through different messenger and social media apps. They also play online games after school and on the weekends that the phone-deprived child won’t be able to join in. Without a phone, not only will your child start to feel left out at a certain age, he may actually be left out. There isn’t a long list of cons when it comes to giving your child a cell phone, but the few that exist weigh heavily enough to consider whether they are stronger than the pros. Even though we’re still just seeing the affects of cell phones on a generation of kids, early studies aren’t favorable when it comes to what technology has done to real life, in-person relationships. Many kids report they have a lack of deep meaningful relationships and don’t feel like their friends are actually close friends, which makes sense where the majority of our communication not only lacks the in-person connection, but is done through some form of messaging rather than voice. Disagreements, arguments, and constant nagging can result from your child thinking she needs to be on her phone much more than you know is appropriate. Having your child grumble because she has to put down her phone, come to dinner, and actually talk to people in person is not a family environment any of us want to create. Of course, once expectations are set, hopefully your child will be accepting of the limitations. And as busy parents we have to be conscious about making the limitations, as it can be tempting to let our kids over-entertain themselves with the phone so we can do our thing. Undoubtedly, not only have peer relationships suffered from over-exposure to technology, but family relationships have too. What’s the Right Age for Cell Phone Ownership? It probably won’t surprise you to hear that there’s no magical right age to buy your child a cell phone. It used to be something many high schools kids were trusted with, but the age when kids get their first phone seems to be on a rapid decline. Surveys and parent discussions see kids as young as seven and eight years old having their own smartphones. Common sense dictates that it’s hard to imagine a scenario when a child that young would “need” a phone. You likely don’t even need to start thinking about this question until your child is at least 10, if she shows interest in a phone that early. Then start asking yourself questions and taking a look at her level of maturity and sense of responsibility, factors that are far more important to the decision than chronological age. - Does your child do what she says she’s going to do when it comes to communicating with you about where she’s going, when she’ll be home, and who she’s with? - Does your child lose things or have trouble keeping track of her things? Maybe start with a cheap watch or MP3 player and see how well your child holds on to it. - Are there reasons your child needs a phone? Does it make communicating easier due to her out of the home activities? Are there any safety reasons? Does her peer group all have phones they use to organize, plan, and socialize on? - How well do you think your child will adhere to limitations you put on where, when, and how she can use her phone? You’ll probably just have a feeling — that good old mom’s intuition — about whether your child can handle the risks and responsibilities of having a phone. Trust that feeling. What Type of Cell Phone is the Right One? Just because your child has a phone doesn’t mean it needs to be the latest iPhone. If you have reservations, or are starting your child with a phone at a young age, go with a more basic flip phone rather than a smartphone. If he handles the basic phone responsibly, calls you when he’s suppose to, answers when you call, he can earn a more full-featured phone as he needs it. 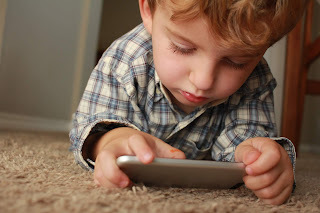 Even once you get to the smartphone stage, you can limit what your child can do and access with some of the parental controls we’ll talk about in a moment. For most kids, having a phone does mean a smartphone, but don’t let that fact pressure you into starting there. Companies like Kurio and Just5 make phones designed for kids, and may be a better starting point for your child. While the fear that your child will lose or damage his $500+ phone is real, the more important fear is that he’ll get into an inappropriate or dangerous situation with his freedom to browse the entire internet and connect with anyone pretending to be anyone in the world. Most phones come with the ability to have parental controls, and many cell phone service providers offer extra protections for a fee. While it’s certainly worth checking these out, most aren’t as robust as the outside apps you can purchase to keep track of your child’s cell phone activity. Most parental control packages allow you to monitor usage, track the location of the phone, and control what features your child has access to. Some also allow you to see texts, browsing history, and photos. In a perfect world, you would have open communication with your child and train her in the correct way to use her phone. You always want to know your child’s login information to all apps she has on her phone, and you may want to start with simply looking at her phone consistently to make sure you don’t see any unacceptable usage. If you suspect she’s having trouble with being granted unrestricted access to her phone, employing some of the monitoring software is the next step. Netsanity, WebWatcher, Qustodio, and Net Nanny are some of the most popular parental control apps available. You’ll want to compare features to see what best meets your specific needs. And if your child is a driver, there are apps like SecuraFone and TrueMotion that let you see how fast your child is driving, and rate and reward your child’s overall driving performance. We hope you’ve found some helpful guidelines here to deciding when your child should get his first phone, what kind of phone it should be, and how much access he should have. One of our goals at Kids Party Characters is to help our fellow moms navigate the ever-increasing complexities of parenthood. Be sure to connect with us on Facebook where we share daily updates on our best parenting strategies as well as tips on successfully working at home while raising your kids. And when it’s time to party, find us at KidsPartyCharacters.com, where we have a selection of over 200 of your child’s favorite characters, as well as cotton candy, face painting, balloon twisting, and bouncy castles to make your child’s party a dream come true.